Sherwood Oregon is filled with many beautiful neighborhoods to live in. Old town vintage, down town charm, traditional elegance, country living and fine luxury estates. Really, there’s something here for everyone. Heron Ridge Estates is a newer development embraced by friendly families and neighbors. Adored by many, Heron Ridge has always been one of Sherwood’s preferred neighborhoods of choice. Heron Ridge Estates was established in 2004 by DR. Horton. This exclusive community features 112 European, Craftsman and Daylight style homes ranging from 1,900 square feet to over 4,000 square feet in size. Current home prices have ranged from the low $300’s to high $500’s, making affordable elegance a realistic possibility. This intimate community consists of Lynnly Street, Roosevelt Street, Sandhill Lane, Seely Lane, Plover Court and Green Heron Drive. 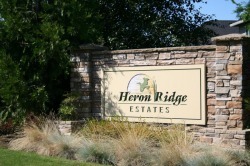 Heron Ridge is a sought after community, privately located off of the Tualatin Valley National Wildlife Refuge. A haven rich in nature, life and beauty. It’s known for its private yet convenient location, walking paths, wide open common areas, green space views and tree lined sidewalks. It offers close proximity to desirable urban conveniences, yet it’s perfectly nestled on the edge town. Grab a pair of binoculars, some bird seed and a camera, and hit the planned nature paths located to the back of the community… With over 200 species of birds who call the refuge home, you’ll soon see why Heron Ridge is a place where life is sure to be best discovered. Copyright © The Gardner Team, Inc. All rights reserved.